Green Day is a California punk band. 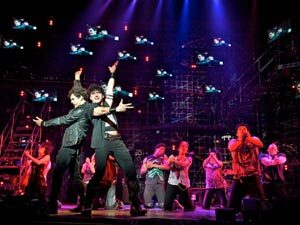 In 2004, the group released the concept album American Idiot, which was transformed into a Broadway musical that opened in 2010. In a concept album, all the songs are linked to a theme or story. American Idiot tells about three disenfranchised friends who want to bolt from their small town to the big city. Johnny ends up in the drug culture, Will has a pregnant girlfriend which prevents his leaving, and Tunny joins the army. There is very little dialogue, so the lyrics carry the story. Unfortunately, if you don’t know the songs, you are facing poor diction and lack of comprehension. The show was nominated for a best musical Tony, and did win for set and lighting. The cast is certainly energetic and Steven Hoggett’s choreography is suitably muscular and athletic. The show is basically a rock concert for Green Day fans. American Idiot continues at the Toronto Centre for the Arts until Jan. 15.